When entrepreneurs are coming up with ideas for a business, or ideas gel and someone utters those immortal words, “Hey, this would make a great business!” guaranteed, no one is thinking about the overall strategy at that moment. “Shikhar Ghosh, a Harvard Business School lecturer, has released research that shows venture-backed startups fail at a much higher rate than previously thought, The Wall Street Journal reports. Most start-ups have a good idea of what they want to accomplish, yet surprisingly few have a clear idea of how to actually get there. The graphic above shows the 4 main phases of the Business Life Cycle, from ideas and creation to the wind up or exit strategy for a going business. Let’s take a look at how strategy moves you forward from one phase to the next. 1. Why did you (or the owners) want to start a business? 2. What did you (or the owners) hope to accomplish- in other words, what was the vision? 3. How long do you (or the owners) plan to be doing this, running this same business? Too many businesses are run like rock bands where creative leaders get together to put out a product, each having his/her own vision of what the end will look like, only to dissolve in disaster or takeover by/ouster of key members. 1. Forecasting and benchmarks: How much in sales/revenue/clients/staff/product development do we expect at Q2? The end of the first year? By Year 3? Know where you want to go and track the data that tells you if you are achieving or drifting. 2. Tactics: What do we need to implement to reach the forecast benchmarks? (Do we have an advertising budget, a marketing plan, the right training and staff? 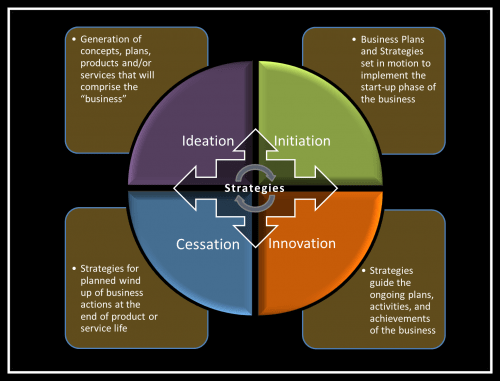 This is the phase that most business people associate with a strategy- the well-known Strategic Plan and Business Plan. Banks and Venture Capitalists will require a sound Business Plan before making a decision to fund a start-up. However, a Business Plan to set up and run a business is not the same as a strategy for staying in business, although many people will treat them as if they are. In looking closely at the SBA Essentials list, you’ll notice that each of the sections except the Financial Projections looks at the present or past (Market Analysis takes in historical performance for your niche market). By contrast, a Strategic Plan looks at the present and future. That’s a significant difference, and one that really shouldn’t be ignored. Creating a Strategic Plan to go along with your initial Business Plan is smart business and is helpful to your case for funding. But beyond that, it is progressive, future-driven business for you. Knowing not only where your business fits in the current landscape, but also how you plan to step your way forward, allows you to keep everyone inside the business on the same page, allows employees to know what their specific role/contribution is in moving the business forward, and ideally, gives you benchmarks to determine if you are heading in the right direction quarter after quarter. Use these answers to craft your yearly Strategic Goal(s). This may be the same or similar Goal(s) each year, or you may create stretch goals that are vastly different each year. Either way, keep in mind what makes a good Goal. Make them S-M-A-R-T. (For more on this, take a look at Applying the #1 Secret to Strategic Planning). Getting your business off to a strong (and SMART) start makes the job much more productive, and successful, and moves you into the middle years smoothly. In the Innovation phase, the business is up and running, everyone is on the same page (ideally) and knows where the business is supposed to be going, and knows what he/she must contribute each day to make it happen. Metrics are necessary to measure each month (or quarter) how closely the business is tracking with benchmarks agreed upon by senior leadership. Words of Advice: Don’t let more than a quarter go by without checking progress. It’s too easy to get off track, and all too hard to get back on track. In the Innovation phase, we also see new product/service streams being launched. Market analysis will tell when the time is right to launch new offerings to existing clients and to gain new clients to move the business to the next level of growth. Objective 2: Contact all existing clients by end of Q1; Confirm satisfaction level via survey. Create the overall ‘Company Strategic Plan’ first. Let’s look at an example of a business that needs innovation. In the case of a typewriter repair shop, to continue to envision being “the premiere typewriter repair facility in the greater metropolitan area” would be crippling. This business market is not expanding and has limited potential. Once you have an overall target, create each Department/Division Strategic Plan from that base. Analyze the vision by understanding how each department contribute to its achievement. Each department or division contributes in unique ways and needs to develop measurements (metrics) to understand whether it is successful or not. This is the importance of department specific metrics and data. It would be unwise to have all data lumped together to the point that one department or division supported the entire company. For example, if Sales achieved 150% of its quota, or benchmark, but Service was not having much repeat business, and therefore barely getting by with 60% of its quota, this would signal a problem area. If all data were viewed together, the resulting revenue total could obscure problems in Service to go undetected. Though the benchmark overall was exceeded by 10% when combined, and which may be cause for congratulation, it masks the underlying instability in Service. Departmental Strategic Plans allow each to focus on growing or identifying end of life issues early enough to take appropriate actions. Every product or service has a useful life. The market changes and moves on. Think about how difficult it would be for that typewriter repair shop in our example to stay in business if it only focused on that one product and service. The market has long since moved on for this business. There comes a point in every business life when the road “forks” if you will. There are two choices that will come, sometimes sooner than later, and should be planned for far in advance. The saying, “Diversify or Die” isn’t an idle slogan- it’s a rude truth of business. This leads us to the next phase. Look at our typewriter repair shop example once again. Let’s create two scenarios: Shop A that innovates and Shop B that ceases business. In the innovation phase, or the period of established daily operation, each typewriter repair shop has the opportunity to scan the market place and see the signs. By tracking sales and repair data, both should see the vigor of the business declining despite increased advertising and marketing efforts. Shop A manager studies the decline and decides to branch out into computers and automated business systems, invests in training its staff in new technologies and gradually tips the scales toward the future. Shop B, however, cuts staff to reduce overhead, implements more ad campaigns and uses social media to reach new customers which helps for a couple of months, but repeat business is becoming slower and slower. Within the year, unable to cut staff any further, the shop goes to half days, and closes on the weekends. This unfortunately has the unanticipated effect of cutting off walk-in traffic by customers who can’t get into the shop during the half-day schedule. Soon the owner must decide to close or sell. Seeing no interest from others in his market, the owner of Shop B decides to close at the end of the year and call it quits before he uses up all his retirement savings. By anticipating a “useful life” (10 years, for example), and determining when you will need to introduce new products and/or services in the future, the business is able to plan a smooth transition and work the announcement into existing marketing plans. The SBA website we linked above also has resources for planning your business Exit Strategy for Getting Out. It’s worth taking a look at what an exit from the marketplace entails. This enables you to have that action plan on the shelf for when the time is right. Conclusion: Knowing Where You’re Going, Everyday. The 4 phases of business life all require continuous planning to account for changes and unexpected occurrences in the market. A good Strategic Plan should be revised as often as needed- usually not more than once each year, nor less than every three years- in order to keep the business in touch with market changes. Your business strategy should grow and develop and change with the business, but always remain grounded in the stable mission and vision that created it. The point of strategic planning is to create a kind of “user’s manual” for how to grow your business. Think “Big Picture” when designing strategy for your business and you will grow your business successfully through all the phases of your business life cycle. Thank you to Strategy Links for sharing this content.